Despite high political tensions in 2015 as general and mayoral elections loom – and particularly as the EU referendum comes ever closer – confidence in London as a commercial hub appears to remain stable. However, construction levels are slowly coming to a standstill as projects finish and no new ones begin, causing rental rates in the West End to begin rising significantly. As such, businesses looking for commercial property in London are beginning to broaden their horizons in terms of office markets. London office space rates remained at a steady level in 2014, with investments totalling just under £20 billion being pumped into the sector. That being said, 2014 ended with some surprises as some of London’s ‘trophy assets’ were seen to change hands – for example the famous Gherkin, which was purchased last year by the Brazilian/New York dynasty Safra. Indeed, with rental prices continually on the increase, a second surprise was seen as some of the previously more obscure sub-markets of London began to billow with success. Diminishing availability, combined with the fact that London continues to cement its place as a worldwide financial and business hub, means new regions of the city are quickly gaining popularity with the commercial sector. King’s Cross has only recently emerged as a submarket of London and has been massively remodelled, making it increasingly attractive for businesses looking to locate in the capital. After the Second World War, King’s Cross quickly declined, becoming a notorious hotbed for crime and seedy activity. However, the 1990s saw the establishment of the King’s Cross Partnership, which worked to regenerate the region. In fact, £2.5 billion has been spent on infrastructure alone over the past ten years, and the relocation of the rail terminus of international rail line Eurostar to Kings Cross has lent a helping hand to the growth and popularity of this London postcode. 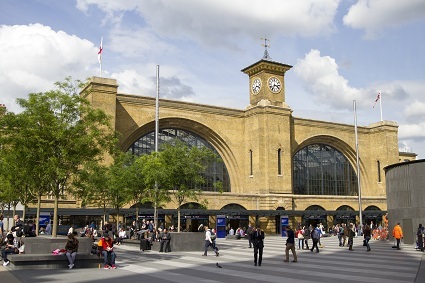 With two major rail stations (and Euston Station only a short hop away) alongside 14 bus lines and an impressively large bike interchange, King’s Cross is a region unparalleled for connectivity – to the rest of London, the rest of the UK and the rest of the world. The presence of world-class rail and leisure facilities has infinitely increased the attractiveness of King’s Cross for businesses wishing to invest in London office space in 2015. King’s Place, a first class office space development, was completed in 2008 and continues to attract high profile corporations such as the Guardian Media Group Plc and Network Rail, both of whom have their headquarters situated within the building. In total, King’s Cross has over 3.4 million square feet of work space spread across 19 newly-built and refurbished commercial properties. Alongside these award-winning office blocks are leisure facilities incorporating music and arts amenities (including an auditorium, teaching and practice rooms) as well as a whole host of trendy waterside restaurants and bars. These exciting and diverse eating opportunities have quickly established King’s Cross as a ‘foodie’s’ paradise. This glut of world-class facilities have attracted technology superstars Google to choose King’s Cross as the home for their brand-new Google UK headquarters. In traditional Google style, the headquarters are said to include a climbing wall between floors, swimming pool and roof-top running track. But perhaps it is only natural that Google have chosen King’s Cross to be their UK hub – the London BioScience Innovation Centre (LBIC) is only a short step away, and this centre of innovation is – in their own words – Where Enterprise Comes to Succeed. With laboratories and office space that are second to none, the LBIC has a firm grip on attracting companies which specialise in biotechnology as well as diagnostic and life sciences products. Combine with the new medical research institute ‘The Francis Crick Institute’ (scheduled to be completed late 2015), and King’s Cross is quickly becoming a world leader in scientific and technological research. Prices of commercial property to rent in King’s Cross vary hugely depending on the facilities available. An average estimate is roughly £82 per square foot. The combination of impressive commercial properties, cultural venues, shopping galleries, big-name businesses and bars, restaurants and entertainments galore make King’s Cross one of the most talked about sub-markets for London office space rentals in 2015. For information on office space availability in King’s Cross click here.